The nearby sea, relief, and height above sea level influence the climate of Herzegovina. 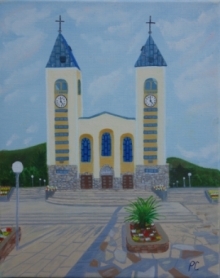 Medjugorje is situated in the part of Herzegovina where the Mediterranean climate, with its gentle winters and warm summers, is predominant. It is characterised by rainfall in the colder period of the year. During winter, the Adriatic Sea gives off the heat accumulated during the summer period, easing winter atmospheric temperatures. In July and August, summer temperatures reach their maximum. Maximum precipitation takes place in the autumn, though rainfall can also be felt in the spring. However, the greatest quantities fall in November and December. Regarding wind, north and northeasterly winds are predominant. Locally, they are referred to as "northerly" or "Bura". Winter is at its coldest when this characteristically dry wind blows every second day. Herzegovina has another recurring wind called "Jugo". This wind blows directly from the Adriatic Sea, most often during the autumn and spring. It is saturated with humidity and in the autumn brings rainfall in large quantities. It is considerable in strength and blows for a few days, after which the showers then stop. On the basis of climatic evidence found in meteorological annals, we can conclude that Herzegovina is influenced by Mediterranean, continental, and mountain climates. And, in the area of southern Herzegovina where Medjugorje is situated, a Mediterranean climate is predominant.